More New Product Sneak Peeks! Before I get on with sharing some more sneak peeks, I want to take a minute to remind you that tomorrow, January 3rd, is the final day that you can order from the YEAR END CLOSEOUT SALE! There are still LOTS of awesome deals just waiting for you to grab them – up to 60% OFF!! These include retired products, current products that are overstocked, and retiring products from the Holiday catalogue. And by the way – tomorrow is the LAST DAY TO ORDER from the Holiday catalogue, as well!! You know all those Bundles that are in the Holiday catalogue? Well, after tomorrow, you may be able to still buy the items if they carried over – but NOT at the special Bundled price of 10% off! To check out the Year-End Closeouts and the Holiday Catalogue online, CLICK HERE to go to my online store. Then you can either order while you’re there, or contact me to place your order for you. Okay – now that my conscious is clear, knowing that I didn’t forget to tell you about the Closeout Sale ending….I can share some new projects with you! 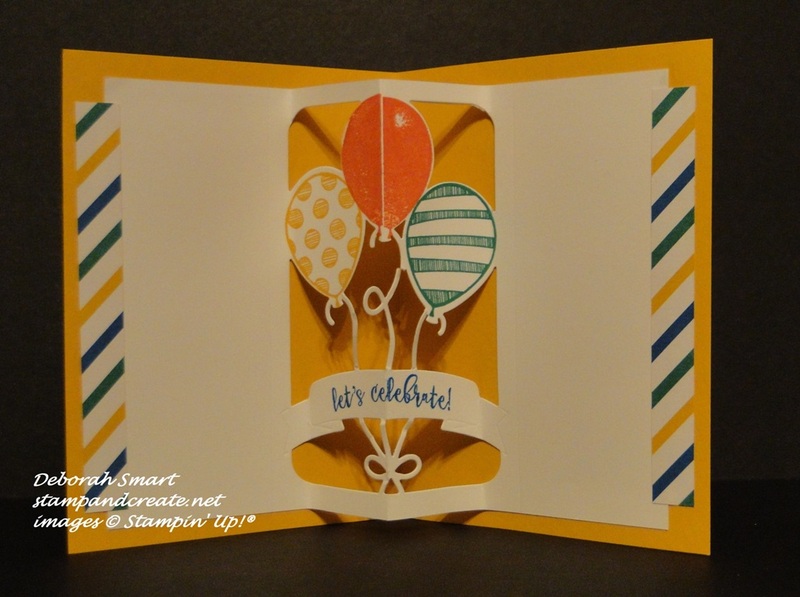 This first card is made with a super fun Bundle, that is made up of the Balloon Adventures stamp set, and the Balloon Pop-Up Thinlits Dies. In fact, there is a whole suite of coordinating products (designer series paper, cardstock, embellishments, washi tape & ribbons) called the Party Animal Suite. It’s awesome for all kinds of celebrations! We started with a card base of Crushed Curry cardstock. Next is a panel of patterned paper from the Party Animal Designer Series Paper – there’s so many fun patterns in this set! On a panel of Whisper White cardstock, the sentiment from the Balloon Adventures set is stamped in Pacific Point ink, and the fun confetti images stamped in Crushed Curry ink. Disclaimer here – I was supposed to attach the Emerald Envy 1/8″ Taffeta Ribbon ribbon across the 2 panels before attaching them to my card base – but I wasn’t paying enough attention (we had limited time to do our projects at On Stage), so I had to improvise, and first glue down the ribbon, then tie and attach the bow on top of it. After adding the ribbon, I attached the balloon, which is from the Party Animal Embellishments, with a piece of Baker’s Twine. You’ll love these embellishments – they’re made from painted silver metal, and there’s 2 designs; the balloon and a blue/silver party hat! Now, I could stop there, and I think that the front of the card is great! However – the real WOW is on the inside! 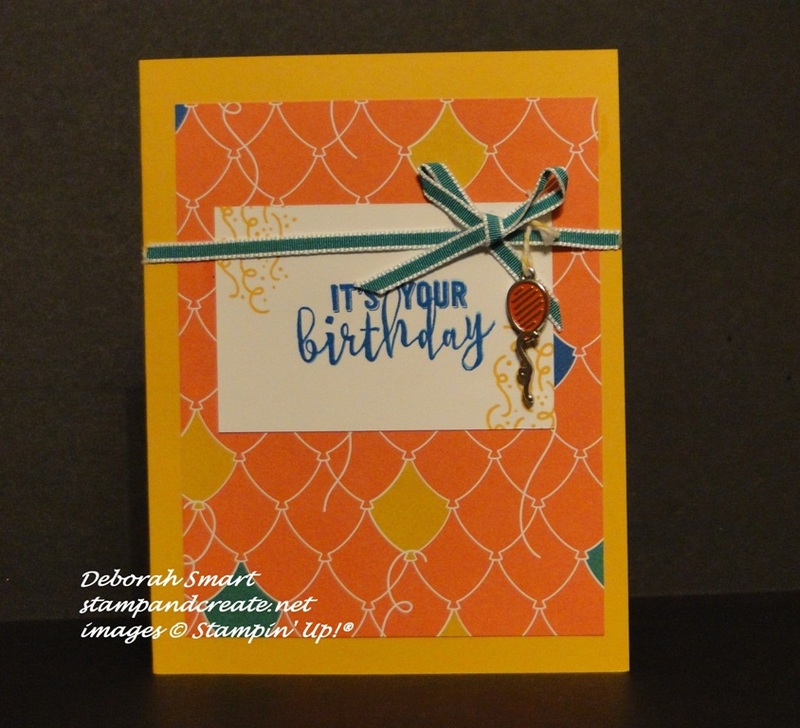 The new Balloon Pop-Up Thinlits Dies are terrific – you can use the largest die as seen above, for inside a card, or you can use it for a card front – and it’s great to use in making a shaker card, too! This die cuts out the banner and balloon shapes away from the middle of the cardstock, so that it pops up when the card is opened. After stamping the die cuts, the pop up was glued to the inside of the card base, then strips of the striped pattern from the Party Animal DSP was glued down along each edge, for an extra punch of colour. It was easy to pull the colours for the balloons from the Designer Series Paper; Crushed Curry, Calypso Coral and Emerald Envy, with the sentiment in Pacific Point. The next project is actually a set of 3, 3″x3″ cards, created using the Sealed with Love stamp set, Sending Love Designer Series Paper, Love Notes Framelits Dies and Sending Love Embellishments – from the Sending Love Suite. Each card base was created by taking a 3″ x 6″ piece of Sending Love Designer Series Paper, and folding it in half, giving you a 3″ x 3″ card base. From the Sealed with Love stamp set, we stamped the sentiment in Real Red ink at the bottom of the Whisper White cardstock square, then stamped the brush-stroke across the middle, in Mint Macaron ink. Using the Big Shot with the Love Notes Framelits Dies, we die cut the heart from Mint Macaron cardstock, and the arrow from Real Red cardstock, and glued them over the brush stroke. Then, we glued the wooden heart, from the Sending Love Embellishments on top, to finish it off. Very quick, and very cute! The second card was even quicker to make! 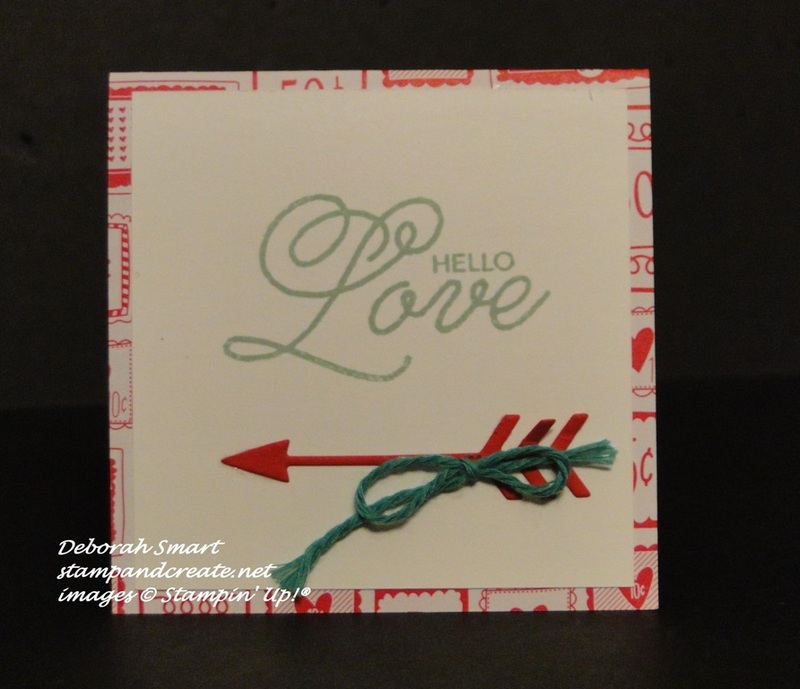 The sentiment from Sealed with Love was stamped just above the midline on the Whisper White cardstock square, and the Real Red die cut arrow glued underneath it. A bow was tied from Thick Baker’s Twine, and glued on top of the arrow. After die cutting and assembling the envelope, we die cut the little note card that fits inside of it, from Mint Macaron cardstock. Before attaching the envelope to the white cardstock panel, we tied a piece of Thick Baker’s Twine around it, and tied off a bow on the front. 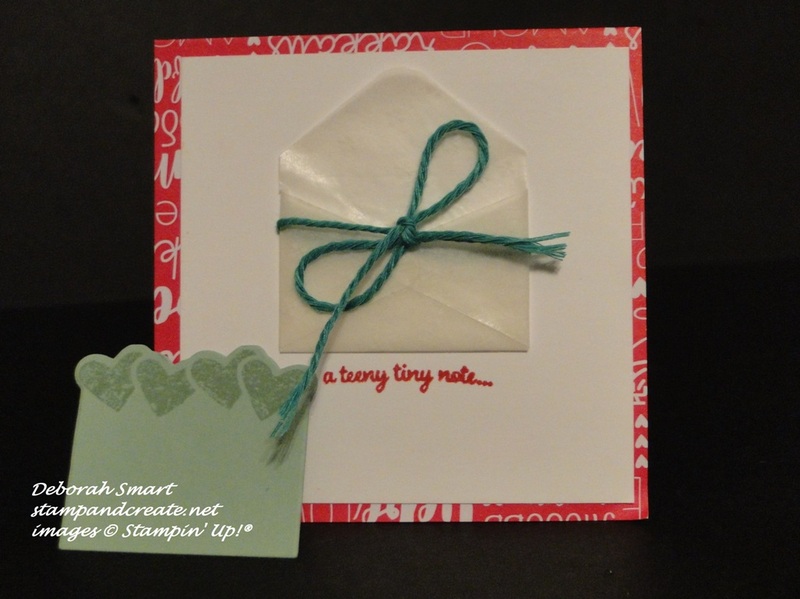 The little sentiment, also from the Sealed with Love stamp set, was stamped underneath the envelope in real Red ink. The die cuts the heart shapes along the top of the note, then you take the matching stamp image from the Sealed with Love set, and stamp the hearts. We used Mint Macaron ink, for a tone-on-tone look. It’s actually big enough that you could write a note! So, that’s some of the fun we had at On Stage, and some of the fun stamp sets and more that you get to order, in just a couple more days! Be sure to come back on Wednesday, January 4th, to place your order! And if you want a lot, but can’t afford it all, check into my Product Shares HERE – you pay a fraction of the price, and get some of all the papers and embellishments! 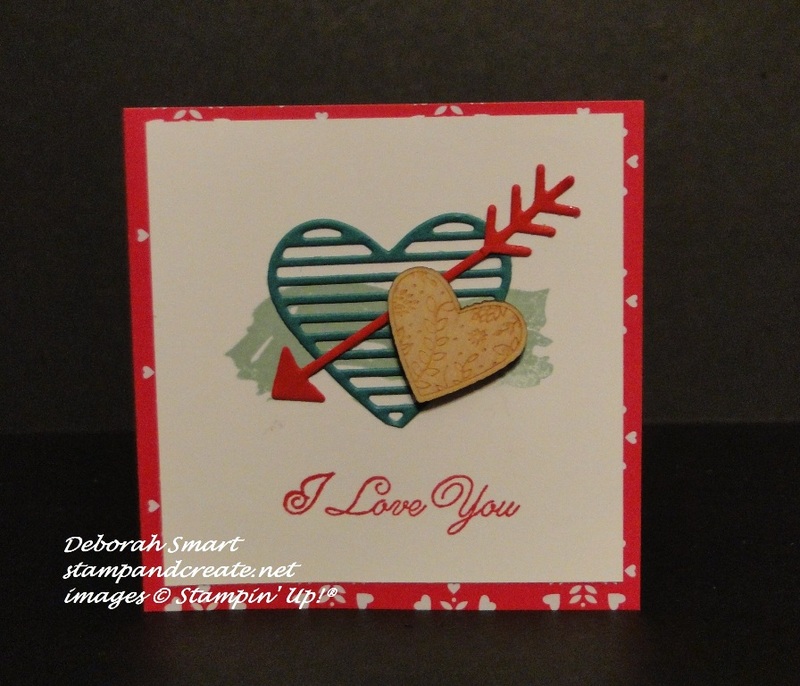 Until then – happy stamping. Previous Previous post: PRODUCT SHARES – ORDER NOW!